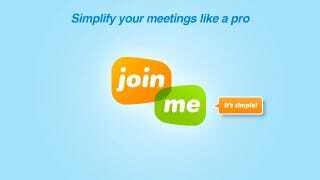 Simplify Your Meetings with Simple Screen Sharing at join.me. The holiday season is hectic enough. So why not remove some of the hustle and bustle from your meetings? In a matter of seconds, join.me lets you meet with anyone online so you can get stuff done. join.me is instant screen sharing at its best. And it's the gift that keeps on giving, thanks to features that'll totally blow your mind and keep your online meetings peppy and productive as a holiday elf. Put your name on it. Everyone likes having stuff with their name on it, right? Like a keychain, or a vanity license plate. So join.me lets you create a personal URL that you can give to your people. It's like having your very own meeting room where you're free to get together anytime. Make an impression nobody will ever forget by uploading your own background image. Then when people attending your meeting see that photo of your cat, Mr. Mittens, they'll know they're in the right place. Do you like to plan ahead? Do you check your list twice, maybe even thrice? With join.me, you can schedule get-togethers in advance, even send out invitations. Want to let a friend drive the meeting bus for a while? With just a click,join.me lets you give control of your screen to someone else. But don't worry –- you can easily swap back. Meet here, there – anywhere. When people aren't at their desk but still need to meet, tell them to download the join.me mobile viewer. There's one for iPhone, iPad and Android devices, because hey –- we like it when the gang's all here. So next time, have your meetings at join.me, and see how simple screen sharing can totally simplify your life. Well, the meeting aspect of it anyway.